Come and get this shirt now so you can wear it on St. Patrick’s Day. ‘Cause I know you’re all excited about the new Duck Tales show. I mean, how could you not be excited about David Tennant doing a Disney project? 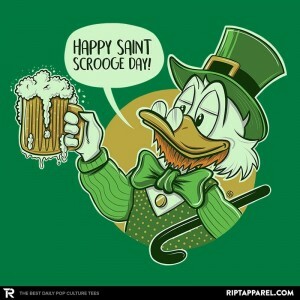 Anyway, Uncle Scrooge is a lot more suited to St. Paddy’s Day than his original Christmas. Remember the Disney Christmas Carol? Yeah, that was Scrooge’s introduction. A Scotsman in the role of an old miser. A little racist, don’t you think? Let’s make him the face of an Irish holiday instead. That’s way less racist. Wrap this cloth around your torso to show your love of beer.